We rely on the generous support and participation of the community to carry out our mission. You can help us make a real difference. Through your generous donations, we’re able to deliver exceptional healthcare and trauma services to anyone in need. 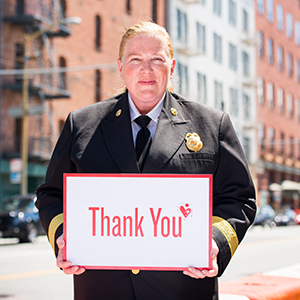 Learn more about giving through the San Francisco General Hospital Foundation. Volunteers are an integral component of compassionate, comprehensive, and cost-effective patient care at ZSFG. Help meet the emotional, recreational, social, and medical needs of our patients. Enhance our quality of care and the overall patient experience. Volunteers are placed in non-clinical and clinical settings – offering opportunities to explore many facets of the hospital. Our most popular positions are in the Emergency Department, Urgent Care Center, Operating Room, and Radiology. Clinical volunteers must have a prearranged agreement with a ZSFG provider and not be enrolled in an academic program. Research volunteers must have a prearranged research placement. Visitors can observe or shadow hospital employees. Call Volunteer Services at 628 206 2444 to learn more. convene to help ZSFG cultivate their groundbreaking visions into impactful innovations. strengthen the web of ZSFG programming so patients can access comprehensive services. advance excellence at ZSFG that enables anyone to get the compassionate care they deserve. are a catalyst, investing in ZSFG to test and incubate new and transformative models of care. foster ZSFG efforts to address the holistic needs of patients in body, mind, and spirit. What an enthusiastic group of public health students. They treat patients with respect and courtesy, and are true team players. We won’t be able to make it without them! Our volunteers are thoughtful, patient, helpful champions for our patients. They may not realize how valuable the work is that they do. This is a better place for having you here! The patient advocate volunteer experience was very positive. Lorena Diaz was very helpful, a fast learner, and caring towards our patients. Volunteers have made such a positive impact at the Urgent Care Center. They make it possible to partner with other departments, like the Wellness Center, and bring the positive energy our patients deserve. Wayfinder are a special group of volunteers! They exemplify selfless service and humility. They work together to improve the patient experience, and create smiles all across campus. The volunteers are a tremendous asset to our department. They help us learn how to better communicate with our patients and to become better providers overall.